Createspace Independent Publishing Platform, 9781475295931, 486pp. Set in the fictional city of Grid, CO-a sprawling metropolis built to look intentionally futuristic-GRID CITY OVERLOAD swirls around three central characters: a budding uppers addict, an informational psychopath, and a schizotypal soda factory worker who believes he's a fish.Two interlocking conspiracies are slowly converging on this trio who are all socially, as well as psychologically, vulnerable to advanced technology in a city that has fostered a technocracy. A ubiquitous software company, InfoZebra, begins construction on a massive new corporate headquarters at the heart of Grid. At the same time, the legal rights to a dying woman's head are called into question. At the center is a prodigiously skilled hacker known as XittyXat (in reality a young woman named Amy Arsenault, an informational psychopath obsessed with manipulating reality through digital means) who transforms both situations into scandals, and in so doing embroils the people surrounding her-knowing and unknowing.What results is a journey into the minds of the citizens, and objects, of Grid. Based on Alvin Toffler's theory of information overload from his 1970 book FUTURE SHOCK, the novel tells the story of people living in the final years of the Information/Technology Age as humanity nudges into a new era of advancement. Narrated by a diverse cast, including monastic cultists, overfueled addicts, anti-identity authors, a jethead inventor of a modern religion, a retired hitman, and a sentient phone fraught by love and revolution, a portrait of high-tech civilization emerges in which human beings are abstract and reality takes on a new meaning.2012 ForeWord Magazine's Book of the Year Award Winner-HONORABLE MENTION..".equal parts fast-paced mystery and thoughtful, existential reflection...GRID CITY OVERLOAD is in many ways the BRIGHT LIGHTS, BIG CITY of the current generation." -ForeWord"The reader is presented with these intersecting narratives and versions of their truth in a world that is speeding increasingly towards an information apocalypse...forces you to examine the amount of information you receive on a daily basis, and how you are receiving it." -Long Beach Post"Full of neon corporate logos and industrial pollution...the novel plumbs the lives of these characters as they lose themselves in drugs and technological advances." -Kirkus"It's a rare and wonderful thing to chance upon a novelist this young already writing with this much precision, this much control, and having this much fun with it all. Steven T. Bramble is a writer to watch, and to be reading-not later-but NOW." -Stephen Graham Jones, author of THE BIRD IS GONE: A MANIFESTO and DEMON THEORY. Steven T. Bramble is author of the novel AFFLICTION INCLUDED. He was born in Pueblo, CO in 1986 and now lives in Long Beach. 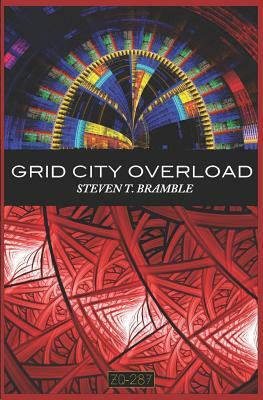 GRID CITY OVERLOAD is his second novel.